SUZY BELLE is an exceptional three stateroom raised pilothouse offshore cruiser. Her design and equipment allows for easy operation by a couple without the need for crew. A large aft deck/cockpit with built in seating leads into a spacious salon through double doors, or allows easy access with built in steps to an integrated swim platform. Covered walk around decks with bulwarks and a Portuguese bridge forward make line handling simple and provide safety at sea. The foredeck has a built in seat ahead of the Portuguese bridge, and easy access to the double capstan windlass with a substantial anchoring system and ground tackle. 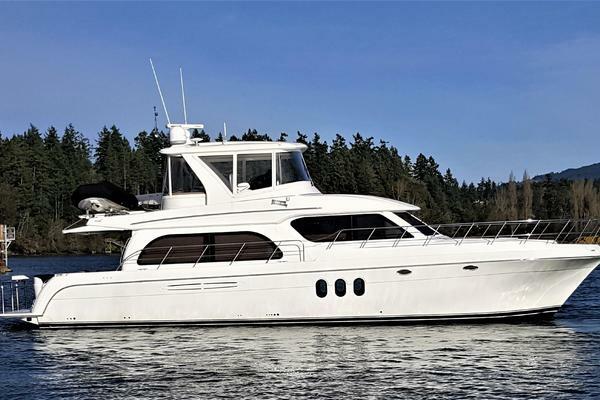 The main salon and galley are adjoined with abundant built in seating, dining area, large opening windows, on deck head, granite galley counters, pantry, and with exceptional headroom provide a very spacious feeling. Moving three steps up and forward is the raised pilothouse, with built in seating, hinged table, Stidd helm seat, opening port and starboard doors, chart and additional storage areas and great visibility. From an inside staircase on the starboard side of the Pilothouse there is access to a huge flybridge with a Stidd seat, built in seating, vast storage areas, tender and davit. A curved staircase from the pilothouse leads to the two guest staterooms, including a large guest stateroom with upper and lower berths to port, large guest head and shower to starboard. The VIP centerline queen berth stateroom in located further forward with ensuite acess to guest head. The master is entered off a separate staircase from the galley, with king walkaround berth and large ensuite head with large shower. Engine room and lazarette access is either from a large opening hatch on the aft deck, or from a second entry from the master. SUZY BELLE is a reflection of her owners commitment to constant upgrading of their yacht, which has taken them comfortably from their home base in Coral Gables to many beautiful destinations in the Bahamas, and throughout Florida and the Keys every year since their first ownership of this vessel in 2013. In every area of the yachts interior you will feel comfortable and relaxed, surrounded by the beauty of the high gloss varnished teak paneling, and the exterior gleams as well. 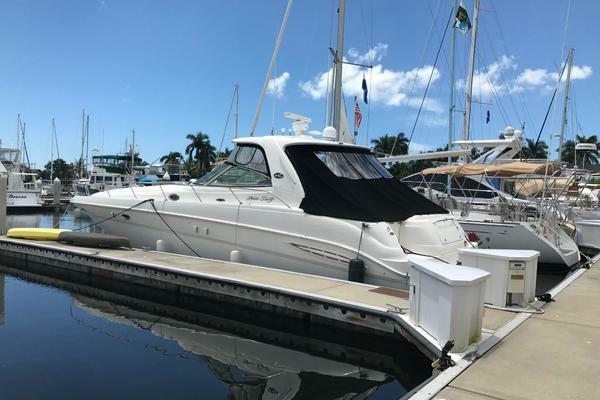 With the upgrades to equipment and systems along with the constant maintenance program that this vessel has enjoyed, SUZY BELLE is ready to go to sea, and is easily handled by a cruising couple. Her fuel efficient 275hp Caterpillar diesels, have a semi-commercial rating which gives them an extraordinary lifespan, and better than one gallon per mile total fuel consumption at 9 knots. Top speed of 10.5 kts with a cruising range of 1,500 + miles. 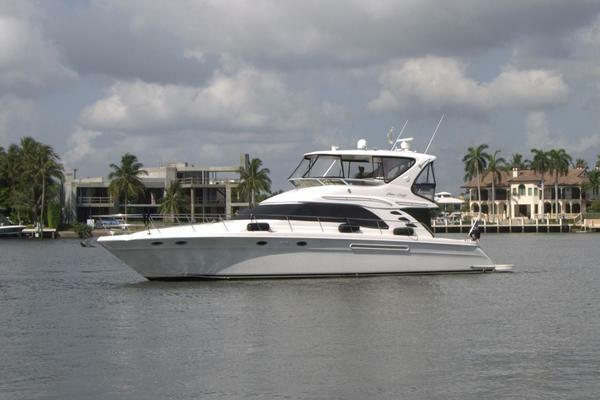 With the tinted windows, the air conditioning system is fully capable of keeping the boat cool and comfortable on the hottest Florida and Bahamas days. Professionally maintained over the last 10 year for an experienced owner with both very high standards and an open checkbook.